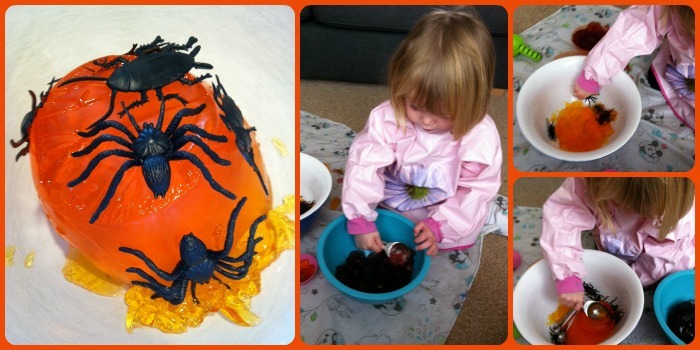 Today we had some Halloween themed messy play fun with jelly! I'm amazed by how long Little Miss A actually spent playing with this. It's the longest she's stayed engaged with this type of activity for a long time! As soon as I put the bowls down, she was keen to get going and play! It was so interesting to see what she did as I left her to her own devices and didn't guide her play at all. I made up two batches of jelly yesterday - orange and blackcurrant. You could use any flavours but I thought these were good Halloween colours. I added some plastic spiders and beetles on top - I think they looked pretty cool! Then I put the bowls down onto a plastic mat (to try to contain some of the mess!). Last year we played with the jelly outside and this is definitely preferable but can't be helped when the weather isn't as nice! I also put out some spoons and smaller bowls so Little Miss A could scoop the jelly up and transfer it about. I took the precaution of putting her in an coverall. Think I should have put her in her rainsuit as her leggings and socks ended up covered in jelly too! Firstly, Little Miss A picked out all the creepy crawlies. Then she started scooping up the jelly and putting it into the various smaller bowls - naming various members of our family who each bowl was for. It wasn't long before she got her hands in though. I tried to get her to taste the jelly as it was perfectly edible, but surprisingly she wasn't that keen. She just wanted to squidge and squash it in her hands! I'm really pleased I put this together for Little Miss A. She really did enjoy it. I must get into the habit of doing more messy play with her again. It's been over a year since we used jelly to play with, Little Miss A was less keen before to get her hands stuck in, not so today! 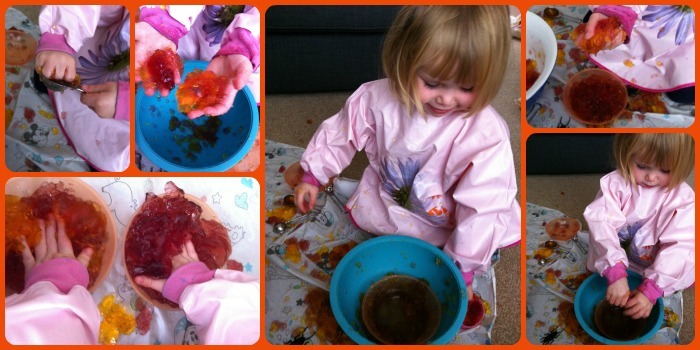 You can read about her first experience of jelly messy play here.